If you're worried about the rise of One Nation, do something. Nigel Farage playing besties with Donald Trump. President Barack Obama hosting President-elect Trump at the White House. 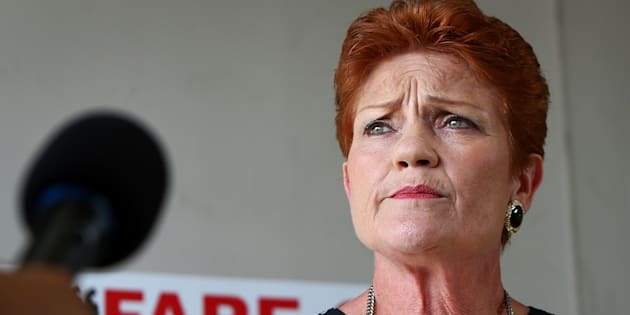 Pauline Hanson elected back into Parliament. It's been one hell of a 2016 and I haven't even touched on the heartbreaking situation in Aleppo, the disgraceful and inhumane treatment of people on Manus and Nauru, or Philippines' President Rodrigo Duterte who recently bragged about killing people while he was Mayor. Or Prime Minister Malcolm Turnbull's refusal to turn up the heat on his colleagues in order to meet our Paris climate change commitments with policies to reduce carbon emissions. For some (and understandably so), the hangover from 2016 may prove a little harder to shake off than the consequences of overindulging on New Year's Eve. Let's face it, a lot went wrong in 2016 but there were a few rays of sunshine. Native Americans halted an oil pipeline from destroying ancestral homelands. The people of Malawi reduced the number of children contracting HIV by 67 percent. Despite our own Government allowing Australian aid to hit record-low levels, global investment in aid and development grew by 7 percent. Volunteers known as the White Helmets rescued tens of thousands of people in the Syrian war. People power helped force our Government to agree to a one-off humanitarian intake of 12,000 people seeking asylum from Syria and Iraq. People power around the globe was on full display in the 'Let Them Stay' and 'Black Lives Matter' movements and the growing 'resistance' movement to Trump in the US with many, particularly youth, shocked out of their political apathy. Meanwhile, here in Australia, thousands of caring people and more than 65 organisations signed a 3.5 metre high letter to our Prime Minister to call on the government to do more to fight poverty. Many of us have spent this summer break trying to tune out from the world and a lot of the events that took place in 2016. But if the dramatic events of 2016 do nothing else, they should act as a wake up call. A wake up call for those who think Australia is isolated from the issues the world is facing. We're not. A wake up call for those who think we ought to isolate ourselves or focus only on ourselves. We can't. We're part of a global community. We are not mere bystanders. It's up to us to demand a better world and demand that Australia does more and swim against the protectionist and isolationist tide. We each have a role to play and we must look back to December as a starting point for the way forward. Late last year, the Government announced it is drafting a long-term plan for Australia's foreign policy and that they'll be seeking public views. In a world where the stakes couldn't be higher, this is a big opportunity for us to share our vision of an Australia that is a compassionate global citizen helping to build a more equal and more sustainable world where we end the injustice of poverty. Public submissions are open right now and will close on February 28. Trump, Syria, people seeking asylum, war and conflict, millions of people living in poverty... we can do better. If enough of us share our vision of a compassionate, outward-looking Australia, we can shape the role our country plays in the world. This is our moment -- to speak out, to show up and promote a world where all women, children and men have an equal chance to fulfill their potential. Remember, it's up to us. On February 1, the Campaign for Australian Aid will be launching an online tool to make it easy for the public to have its voice heard and their volunteers will be out in the community from mid January collecting public views. Sign up to get updates on how you can submit or help lead this moment.